My first experience with Frisbee-esque stuff was throwing in the front yard with my dad. Starting when I was around 6, we threw Frisbees, flying rings, and Aerobies in addition to the more traditional baseballs, softballs, etc. I've been playing ultimate regularly since I started playing pickup in during freshman year of high school in 1988. I'd played before then at various summer camps. During my senior year, I started practicing with the College of William and Mary ultimate team, then called the Wizards. When I went to UNC Chapel Hill, there wasn't a college team at first, and I played with R.A.T.S. (Rough and Tumbly Sorts, a Flatball Nation precursor) during my freshman year. I also started playing Winter League that year, and my team (Swamp Thing) made it to the semi's in the tournament. I met Mark Parris then and there was a little talk about starting a team at UNC. The next fall, some guys from Charlotte Latin came to UNC and did most of the work of starting UNC Darkside. In '93/'94, Darkside's inaugural season, I was captain (with Mark), but then I decided to drop the leadership responsibilities and just play. The next season, I was voted Most Valuable Player and Most "Offensive" (at least in terms of joke telling ability; it's not that my jokes are really "offensive" in a "people get angry that I've insulted their race, gender, or cultural heritage way," it's that my sense of humor is particularly dry :-). In 1994 and 1995, Darkside went to the WAFC April Fools Tournament. We put our 1995 Fool's Bid on the WWW. I had a card made for it. In the years I played with Darkside, we were always one or two notches below the competition in NC. The Irates of ECU, the Seamen of UNC-W, and Jinx of NCSU were always significantly better than we were. However, starting in the Fall of 1997 with an upset win over ECU in Athens, Darkside has been on the rise. The team finished in the top 8 at College Nationals in Boulder, CO in 1999. I've also played with the co-ed team Elvis Needs Boats. The vast majority of the team is made up of current and former UNC-Chapel Hill Ultimate players (from Darkside and Pleiades). We've met with some success. We finished second at the Hodown Throwdown Showdown in Asheville, NC in 1997 and qualified for the Co-ed Celebration in Chicago. In Chicago, we made the semifinals losing to the eventual champions. We also made it to the semifinals of the 1998 Carolina Kudzu Co-ed Classic and the 1998 Hodown Throwdown. At the 1998 Co-ed Celebration in Lexington, Kentucky, we again made it to the semifinals, again losing to the eventual champions. I played with Ring of Fire from 1998 through 2004. In the Spring of 1998, we won Terminus and finished second to DoG at the PADA Mothers day. In the Fall, we won the Tune-Up in Chicago, the Choptank Open in DC, NC Sectionals, and Mid-Atlantic Regionals. At Nationals, we made it to the semifinals before we lost to the Condors. In 1999, we won Terminus in Atlanta and finished second at the Choptank Open. At the World Ultimate Club Championships we finished ranked 5th overall. Our only losses were to the eventual finalists: DoG from Boston and Liquidisc from Finland. At the Tune-Up this year, we were eliminated before the semifinals. In UPA competition, we won NC Sectionals and Mid-Atlantic Regionals, and finished in the top 8 at UPA Nationals, again losing to the Condors, but in the quarterfinals. In 2000, Ring of Fire won Terminus, Choptank, NC Sectionals, Mid-Atlantic Regionals, and finished 5th at UPA Nationals. Also in 2000, I played with Spear, a co-ed team from the RTP area. We won the UPA 2000 Coed National Championship in Blaine, Minnesota. In 2001, Ring won Terminus and Mid Atlantic Regionals. Also in 2001, Spear won the WUFF 'Co-ed Nationals' in Wilmington, NC. In 2002, Ring won the Boston Invitiational and Charlotte. We made the finals at the UPA championships in Sarasota, Florida where we lost to Furious George. 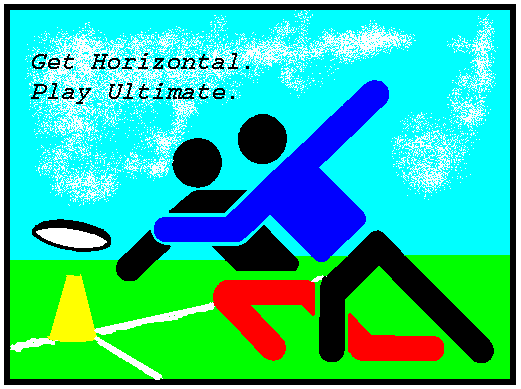 Also in 2002, I played with Blue Ridge Ultimate (BRU) at the World Ultimate Club Championships. We finished 4th in the mixed division. In 2003, I played with Dodge at the Seven Little Idiots tournament in Athens, Georgia. We won the tournament. Ring of Fire won Terminus, Tune-Up in Chicago, and lost in the semifinals at the UPA Championships. In 2004, Dodge won the Seven Little Idiots again. I played with champions Peggy Cronin at April Fools Fest. Ring of Fire won the Boston Invitational. William and Mary Wizards: late Fall 1991 - Spring 1992. UNC Darkside Ultimate: Fall 1993 - part of Spring 1997. Flatball Nation (now defunct) Fall 1996, Fall 1997. Burning Spear: Summer 2000. Won UPA mixed division championship. Blue Ridge Ultimate (BRU): Summer 2002. We placed 4th in the Mixed division at the WFDF World Ultimate Club Championships in Hawaii. Here are some pictures of me playing Ultimate. Here are some pictures of Ultimate teams I've played with. I also play significant amounts of Disc golf when I have the time outside of Ultimate. Lately I've been getting into cycling, mostly on the road. I have a 2003 Trek 5200. 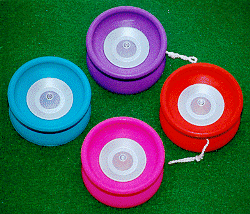 Yo-yo's. I have lots of yo-yos. My favorites are the Henry's Viper and the Super-Yo Samuari. I highly recommend them.